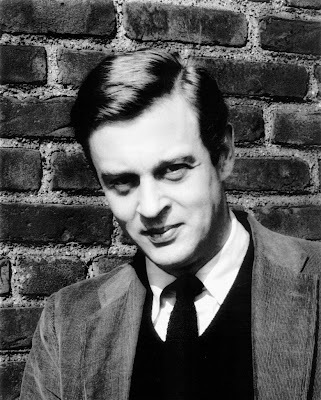 Soon we'll be hearing a lot about Richard Yates (1926-1992), labeled "one of America's least known great writers" by Esquire years ago. December 26 is the release date of Sam Mendes' film adaptation of Yates' Revolutionary Road (1961) depicting the American Dream askew. The film is already attracting media attention because it reunites Leonardo DiCaprio and Kate Winslet. Also in the cast are Kathy Bates, Kathryn Hahn and Zoe Kazan. Some writers have noted the influence of Yates on Mad Men, and commercials for the movie have been shown in Mad Men episodes. I caught an item around 1985 that Yates and William Styron would be doing a reading at Boston University, so I went. On a warm sunny afternoon, I was surprised to find an audience of only about 35 people in a fairly large BU lecture hall. As I recall, the situation was that Styron would read Yates, while Yates would read from his screenplay of Styron's Lie Down in Darkness. However, it soon became apparent that Yates was a no show. This was a genuine disappointment, but Styron carried on solo, giving a magnificent reading of the entire first chapter of Revolutionary Road. Sunlight poured through the windows. As Styron's great voice echoed through the hall, Yates' characters came to life, dancing among the dust motes. 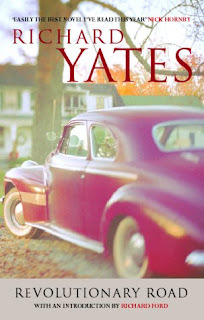 Here's a good Slate article on the cinematic cul de sac of Yates by Blake Bailey, author of A Tragic Honesty: The LIfe and Work of Richard Yates (2003). Yates used to hang out at the Crossroads Restaurant on Beacon Street in Boston. Here Marty Jukovsky writes about meeting Yates at the Crossroads. I think I meant it more as an indictment of American life in the 1950s. Because during the Fifties there was a general lust for conformity all over this country, by no means only in the suburbs — a kind of blind, desperate clinging to safety and security at any price, as exemplified politically in the Eisenhower administration and the Joe McCarthy witchhunts. Anyway, a great many Americans were deeply disturbed by all that — felt it to be an outright betrayal of our best and bravest revolutionary spirit — and that was the spirit I tried to embody in the character of April Wheeler. I meant the title to suggest that the revolutionary road of 1776 had come to something very much like a dead end in the Fifties. The final dying sounds of their dress rehearsal left the Laurel Players with nothing to do but stand there, silent and helpless, blinking out over the footlights of an empty auditorium. They hardly dared to breathe as the short, solemn figure of their director emerged from the naked seats to join them on stage, as he pulled a stepladder raspingly from the wings and climbed halfway up its rungs to turn and tell them, with several clearings of his throat, that they were a damned talented group of people and a wonderful group of people to work with. "It hasn't been an easy job," he said, his glasses glinting soberly around the stage. "We've had a lot of problems here, and quite frankly I'd more or less resigned myself not to expect too much. Well, listen. Maybe this sounds corny, but something happened up here tonight. Sitting out there tonight I suddenly knew, deep down, that you were all putting your hearts into your work for the first time." He let the fingers of one hand splay out across the pocket of his shirt to show what a simple, physical thing the heart was; then he made the same hand into a fist, which he shook slowly and wordlessly in a long dramatic pause, closing one eye and allowing his moist lower lip to curl out in a grimace of triumph and pride. "Do that again tomorrow night," he said, "and we'll have one hell of a show." They could have wept with relief. Instead, trembling, they cheered and laughed and shook hands and kissed one another, and somebody went out for a case of beer and they all sang unanimously, that they'd better knock it off and get a good night's sleep. "See you tomorrow!" they called, as happy as children, and riding home under the moon they found they could roll down the windows of their cars and let the air in, with its health-giving smells of loam and young flowers. It was the first time many of the Laurel Players had allowed themselves to acknowledge the coming of spring. The year was 1955 and the place was a part of western Connecticut where three swollen villages had lately been merged by a wide and clamorous highway called Route Twelve. The Laurel Players were an amateur company, but a costly and very serious one, carefully recruited from among the younger adults of all three towns, and this was to be their maiden production. All winter, gathering in one another's living rooms for excited talks about Ibsen and Shaw and O'Neill, and then for the show of hands in which a common-sense majority chose The Petrified Forest, and then for the preliminary casting, they had felt their dedication growing stronger every week.